You never know what might happen when the snow starts to fall. Everyone should have a three- to six-month emergency fund for unexpected expenses, like when four feet of snow caves your roof in — God forbid, of course. 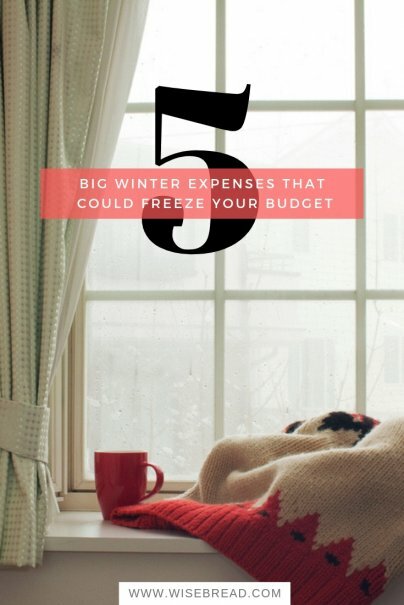 While you can't control life's curveballs, you can prepare and perhaps avoid big winter expenses. Here's how. Cranking up the heat helps maintain a comfortable temperature in the home, but extreme cold can push a heating system to the max, causing it to quit on you at the worst time. A basic service call to diagnose a problem can cost upward of $100 — mine was $95 earlier this winter when my system wasn't working — and this doesn't include the cost to fix any broken components. (Luckily mine didn't require anything out of the ordinary. I got away with just the $95.) If your system is older and needs replacing, however, you'll have to shell out thousands of dollars for a new one. There's no way to predict when a heating system will break, but getting a home warranty can help you deal with this unexpected cost. These plans — which cost about $400 to $500 a year — are like an insurance plan for your home's major systems. If your appliances — water heater, plumbing, electrical, heating, and AC system — need a repair, give your warranty company a call and they'll send a technician within their network to fix the problem. You just pay a flat $50 to $75 out-of-pocket service fee. If the technician can't fix the heating system, your warranty company pays the replacement cost. There are limitations, so make sure you understand how your plan works. For example, your warranty company may only replace the unit if you can show a record of annual tuneups. As such, it's important to stay on top of things so you don't restrict yourself when it comes time to take advantage of the warranty. Maintaining a warm, cozy home in the winter often requires turning up the heat. But while this keeps your home nice and toasty, high gas bills can wreak havoc on your budget. Fortunately, there are ways to stay warm without draining your bank account. Use space heaters in rooms where you spend the majority of your time. These smaller appliances use less energy and you'll save money compared to setting your thermostat at a higher temperature. Another option is a programmable thermostat, which lets you keep your thermostat at a lower temperature during the day when nobody is home. Mine also has a mobile app that allows me to turn the heat on and off and adjust the temperature from my phone; very convenient if I've forgotten to turn off the heat after I leave the house. Additionally, call your gas company to see if you're eligible for a budget plan. If so, the utility company looks at your average gas bill over a six- or 12-month period, and based on what you've paid in the past, the company comes up with a flat monthly payment. This makes it easier to budget. You know what you'll pay from month-to-month and there are no surprises. Cold temperatures can damage your car and result in costly automotive repairs in the winter. Battery problems, starter issues, and leaks are common problems. To minimize winter car troubles, schedule a winter tuneup or inspection before you face any of these issues. Your mechanic may recommend replacing a battery that's more than four years old, replacing worn tires, as well as repairing any maintenance issue that could be made worse by consistently cold weather, resulting in an even bigger repair bill. Cold temperatures also can cause frozen pipes, which can burst resulting in an expensive plumbing bill. The good news is that most homeowner insurance policies cover the cost to repair damaged pipes. But even if you're covered, you'll still need to cover the cost of your deductible, which can be $500 to $1000. Obviously, it is better to avoid a burst pipe in the first place. To do this, drip your faucets during extreme cold weather. A slight drip keeps fluid moving through your pipes and helps prevent freezing. Also, insulate pipes in unheated areas and keep the temperature in your home at a reasonable temp to ensure your pipes stay warm. You also may be able to turn some of them off completely, like outdoor lines, which I do for spigots and my outdoor shower. Snowy weather is an opportunity to enjoy outdoor winter activities with your family, but heavy precipitation can cause big problems if left on your roof for too long. The weight of heavy snow and ice increases the likelihood of your roof caving in. Plus, melting snow and ice can reveal hidden roof problems and cause a water leak in your home. Your homeowner's insurance policy may cover the cost of a roof caving in, but you're on your own if snow causes a major leak. Have your roof inspected and replace it if necessary. If you can't afford to replace the entire roof, patch worn areas, and carefully shovel snow off your roof to avoid damage.